Planetary work is not really my strongest skill in astrophotography, but with Jupiter near it’s highest in this and the past few years, it is well placed for photography from the UK. Additionally, this is one of the first chances I have had to get images with the large 14″ reflector using my ZWO ASI-120MM. I chose to use the Astronomik 742nm Near-IR filter to try to improve the results: on both occasions it has resulted in much better resolution than with unfiltered white light. In addition I used a Meade Series 4000 2x Barlow lens. With regard to conditions, I think I’m a little limited by my observing location where I have to observe over the top of our row of houses – the thermal currents (including from boilers, open fires, etc) are likely to do little to help the seeing here..! First image is from the 17th March during Callisto’s shadow transit (taken at 23:08UT) – Callisto itself is also visible at about 7 o’clock (and clearly resolved into a disc – at 1.5″ the seeing was clearly not so bad..!). 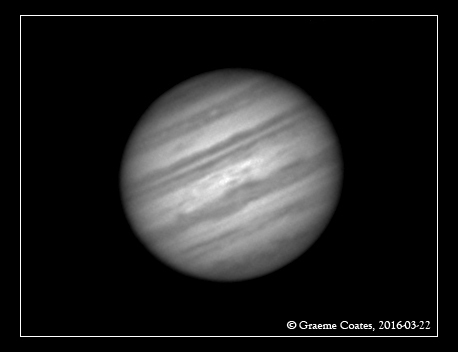 Second image was taken on 22nd March 2016 – the results weren’t quite as sharp as those from the 17th. Unsure if this is a focus/collimation issue, or if the seeing just wasn’t as good. The processing is a little heavier to try and bring out the cloud contrast where possible too. Collimation of an f4.5 scope is fairly critical, and any slight shift can reduce image quality quickly. Equally, at f9, focusing is tricky with a fairly dim extended object – this is something I need to work on in the future – a Bahtinov mask is on the list of makes for when I have successfully rebuilt this scope. 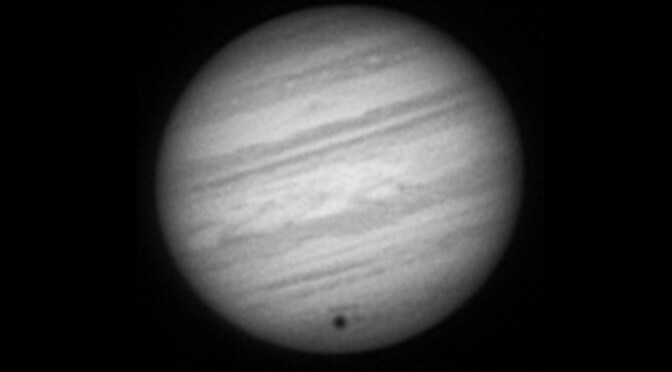 All images were 2 min videos, recorded using FireCapture, processed in AutoStakkert, Registax 6 and Photoshop CS4.